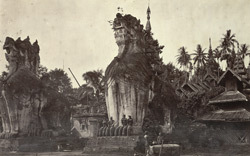 Photograph of chinthes flanking the north entrance to the Shwesandaw Pagoda, taken in about 1868, part of the Dunlop Smith Collection: Sir Charles Aitchison Album of Views in India and Burma. The photograph is unsigned and is probably by J. Jackson. The two massive carved chinthes or leogryphs are mythical animals composed of part-lion and part-griffin, and are the guardian figures of Burmese temples. The Shwesandaw Pagoda or Pagoda of the Golden Hair Relic is a stupa shrine sited on a hill overlooking the town and river at Prome (Pye or Pyay), and is reached via a covered walkway leading up a palm-fringed hillside from the entrance shown. It is one of the most sacred of Burma's shrines since tradition states that it was built to contain hair relics of the Buddha and popular belief dates it from his lifetime. Legend recounts that he visited the area and prophesied the foundation of the nearby ancient Pyu capital of Thiri Kettaya (Sri Ksetra). This print also appears in volume II of H.R. Spearman's ‘The British Burma Gazetteer’ (2 vols., Rangoon, 1879-80), p.490.